It has been a 30+ year love affair but all things must come to an end. With a sad sad heart its time to say good buy and let someone else take on the mantle of Chapter Master of the Crimson Fists. 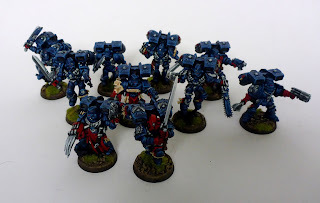 This army has taken many years to collect and paint and it is obvious that the later painted figures are better as my painting style changed, from; table top standard i.e. just get it on the board to the later -me beginning to slow down and enjoy painting. 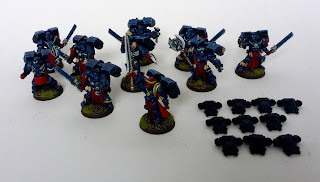 10 Tactical Marines - I'm missing a Sergeant but a have an extra one below.